I have an idea! Why doesn't someone start posting the SATURDAY Photo Scavenger Hunt on MONDAY? Creative isn't it? Ok, enough silliness...my internet access has been either non-existent or very precarious for the last few weeks. In fact, my last post, more than 2 weeks ago, was posted by Mom, following my log-in and publishing instructions over the phone, across the Atlantic Ocean. Not wanting to bore you all with the numbingly tedious details of my daily life, I have never fully explained why my blogging (and visiting) has gone from every-single-day to VERY irregular. This is why: I regularly spend half of the week in Naples and the other half at home in Ischia. Otherwise, I must pray while I'm in Ischia, that the moment I choose to venture down to the local sports betting place that has two computers and many leering males happens to be within their operating hours that span a vast 3 minutes and 18 seconds per day. So, without further excuses, here's my better-late-than-never "Saturday" Photo Scavenger Hunt picture, with the theme of memory. 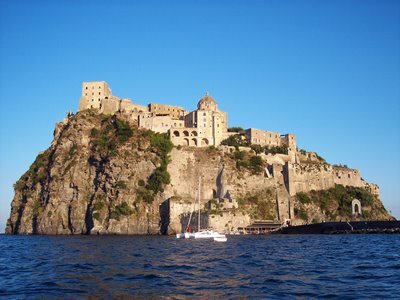 This is the Aragonese Castle in Ischia. (If you would like to read about the history, click here, this page is in Italian, but you can get some other info in English by clicking around.) It's the ancient mascot of an Island that will always be a part of me...it has filled the last 3 and a half years of my life and for the next (?) years, wherever I may find myself, it will be a part of the life experiences that have made me who I am, and who I will be. It will be the protagonist of many reminiscent stories, hopefully proudly recounted to grandchildren who wish their old grandmother would shut up already, or at least put her damn teeth in before talking. Why is it that whatever you are talking about just seems more enjoyable than normal! Just a passing reader who enjoys reading your. Please continue. Thanks, Tracie....the Castello is one of my favorite places on Ischia. I miss it, but hopefully will see it this summer. Are you still taking tourists around the island? I would imagine the bulk of tourists are Germans, and they usually like to hike around the island. Do me a favor.....some time before the week is out, stop by Il Calise in Ischia and buy yourself un cornetto al cioccolato...one for you and me! Keep the posts coming..........I miss them. Welcome back Tracie! Your fans have missed you! I think you should start a procrastinators scavenger hunt! You could have the Saturday hunt ANY day of the week, IF you get around to it! Hehehehehehe! As a big procrastinator myself, I will be your first member! On second thought, lets start the club next week! hehehhee! Glad your back and love the photo! what did you do? Airbrush me out of that photo?! cyn--just so you know, it wasn't my idea, click on the link where it says saturday photo scav hunt and it will take you to the site if you want to join. there's a graphic that i am supposed to be able to put in the post but apparently it only works for reil smart peeple. hey nicky--i took that one from the water on the other site of the ponte...i think airbrushing is a little out of my ability range. why do you think i don't have more pictures of myself? I'm confused....what does this have to do with memory? I'm going to read about the castle now. I am living my dream (Vermont/forests/isolation/property) at my old age. But you? You are so young! I have got to keep reading!